The City Council will hold an open house followed by a public hearing on the rezones proposed for our neighborhood. These maps are part of the City effort to rezone urban villages around the City for the Mandatory Affordable Housing policy. The City hopes to pass a final policy and rezoning maps at the end of the summer, 2018. District 5 + 6 Open House │ Wednesday, February 28, 6:00-8:00 p.m. The open house is your chance to ask questions and talk to city officials. District 5 + 6 Public Hearing, │ Monday, March 12, 6:00 p.m. The public hearing is your chance to comment and express your views to the City Council. Our tip sheet can help as you prepare your hearing comments. Contact the City Council and the Mayor directly by email or phone here. View an interactive map of the proposed zoning changes here – choose “Preferred Alternative Map”. View the zoning maps the city proposed Here. This page also includes proposed housing types allowed in each zone and summaries of community input. The Crown Hill Urban Village Committee for Smart Growth are your neighbors working with local community organizations. We formed in 2016 to address the zoning proposals and extensive rezones proposed for our neighborhood. We are not the City of Seattle. Since 2016, we have advocated for smart growth principles that will benefit all neighbors based around a consistent set of recommendations that were informed by neighbors through a community survey and community meetings and input. Implement CHUV rezoning in phases beginning with arterials, informed by the community planning that was promised to our neighborhood Fall 2017. Planning, design guidelines and infrastructure coordination in advance of rezoning the neighborhood outside of arterials will lead to a better designed and functioning community with less displacement risk to vulnerable neighbors. 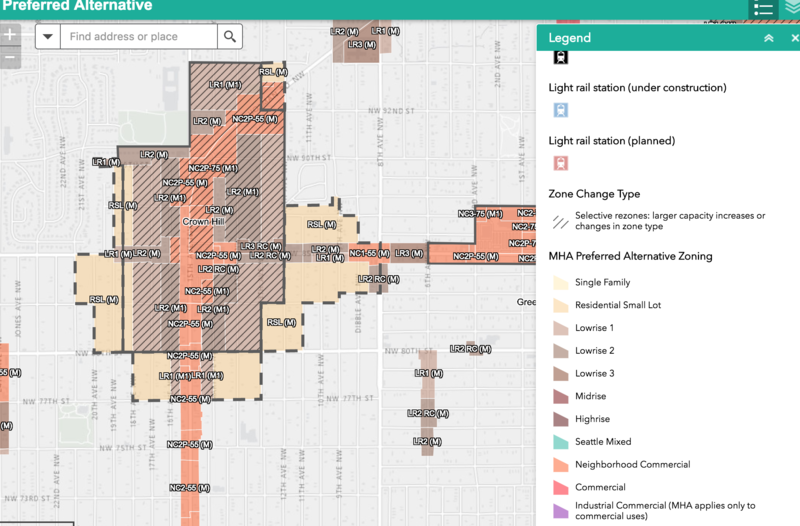 Reinstate RSL zoning on the final zoning maps. Residential Small Lot (RSL) zoning was initially proposed on neighborhood streets closer to 15th, Holman Rd. and 85th, and received extensive community input and discussion for over a year. The zoning maps released in Fall 2017 replace most of our urban village RSL with lowrise zoning. We believe RSL is a much better fit for our community, offers more diverse housing options and has garnered more community support over the past two years. Plan, budget and build necessary infrastructure and transit to accommodate growth. Create more vibrant commercial spaces and a true business district. Read the full 2018 Recommendations Here. Read our take on the Zoning Maps the City released in November 2017 here. We have heard from neighbors with many interests and views for growth. Some want to rezone their block/homes higher to increase profits if they sell or develop. Others want no change at all and fear being displaced from their homes or being unable to age in place due to growth, lack of parking, increased taxes and costs and other pressures to move. Some want a more urban dense community of high-rises and apartments. Others want to maintain housing suitable for families and ample trees and green space. Most are concerned about infrastructure, lack of transit and safe mobility and livability of our community without substantial investments to keep the neighborhood mobile and safe as we grow. Many are concerned that as this policy takes place and impacts thousands of neighbors, long-time community will dissolve, and with it the social safety net that long-term neighbors provide. We encourage all neighbors to come forward and speak up about their preferences for zoning in our neighborhood. Neighbors can use our recommendations to shape their comments as they speak with the City and the tools on the website to communicate them. We hope the end result will be a stronger, more vibrant community for everyone – current neighbors and the new neighbors who will join us. A legal effort is underway to appeal the Final Mandatory Affordability (MHA) Environmental Impact Statement (EIS). This effort is being led by a coalition of neighborhoods from around the city. CHUV is not part of this legal appeal effort. Representatives from the appeal effort (SCALE) have notified us they will be canvasing the neighborhood in February. Learn more about the appeal at Seattle Fair Growth. View this map in an easier to read format at here.